You may have noticed that, here at Banned Apparel HQ, we have a love of not only all things vintage but for the darker side too. Whoever said black is boring could not be further away from the truth! 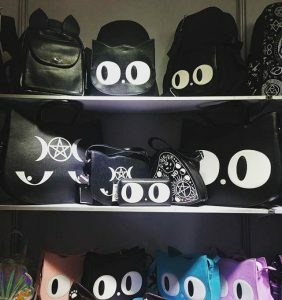 Our slight obsession for black cats runs through our collection, past and even more so in our new season, present offerings. There is, still to this day and believed by many, a stigma attached to black cats who are said to bring bad luck and misfortune. Dating back to the middle-ages in Europe black cats began to be associated with so-called witches. The hysteria of witches practising black magic had just hit Europe and alley cats were often cared for and fed by the poor lonely old ladies many of whom were later accused of witchery. Their cat companions, some of which were black ones, were deemed guilty of witchery by association. This belief was fuelled by a Lincolnshire folklore involving a father and son in the 1560’s. The pair were said to have been travelling one night when a black cat crossed their path and dove into a crawl space. Naturally, they did what any guys would do, they threw rocks at the furry feline until the helpless injured creature scurried out into a woman’s house, who at the time was suspected of being a witch. The next day, the father and son came across the same woman and noticed she was limping and bruised and believed that to be more than just a coincidence. From that day on in Lincolnshire, it was thought that witches could turn into black cats at night. The belief of witches transforming themselves into black cats in order to prowl streets unobserved became a central belief in America during the Salem witch hunts. 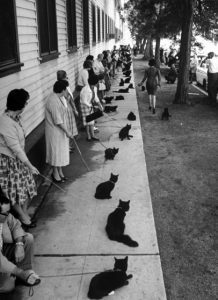 Even today the association of black cats and witches holds strong during Halloween celebrations, despite the holiday’s religious beginnings. Thus, an animal once looked on with approbation became a symbol of evil omens in some parts of the World. But not here at Banned Apparel! ‘The Black Cat’ is also a famous short story written by Edgar Allan Poe. Poe was born in 1809, died at the age of 40 in 1849, and was an important contributor to the American Romantic movement. His work has also been described as mystery, macabre, and Gothic. Poe’s short story, ‘The Black Cat’ was published in 1843 in The Saturday Evening Post. It was popular with readers, but Poe did not receive instant success until he published his famous poem, ‘The Raven’. Since its publication, elements of ‘The Black Cat’ have inspired films, television episodes, paintings, plays, comics, and novels. 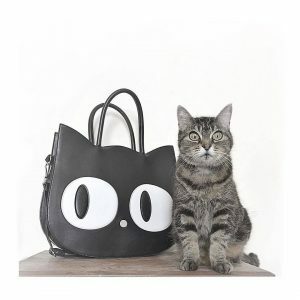 We love the black cat so much that we have extended one of our best selling products, our Heart of Gold handbag, to include shoes, wallets and purses and in various colours. 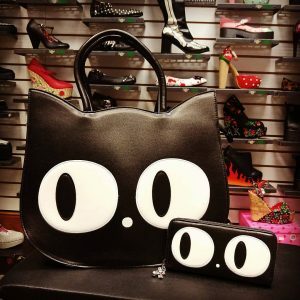 This kitty seems to be fond of his Heart of Gold handbag.